40 Joker Staxx is an old-school casino game on SlotsBaby. It takes everything you know and love from physical slot machines and translates it into a no-frills online slots game. Have a look at other deposit bonus slot game on SlotsBaby! Playson is a leading gaming company with headquarters based in Malta. Specialising in slots online, Playson has also branched out into a range of other popular casino games, including roulette, blackjack and video poker. Their slots range from the sparse classic stylings of games like Sevens & Fruits to more modern and varied works like Legend of Cleopatra, Fireworks Master and Art of the Heist. With a wide range of experience across over 250 staff members, Playson has proved successful in providing complete gaming solutions with the creation of over 40 online slots and casino games. If you love promo's, check our UK slot bonuses today. Visually, 40 Joker Staxx is basic: true to its arcade roots, Playson have chosen to keep things simple for players that just want a basic slot without all the unnecessary bells and whistles that are prominent in most of today’s slots online. With 19 different bet levels ranging anywhere from 0.20 to 100, there’s a stake suitable for everyone from the cautious to the wildest online slots players. There is a generous 40 winning paylines which can be seen by hovering over the 40 lines symbol on either side of the Gameboard. This is one of the few little touches Playson have included with 40 Joker Staxx. Hover over any symbol on the 5 reel, 4 row board and click on the ‘i’ symbol to see the value of matching each symbol. Hover over a symbol without clicking and you will see all winning paylines that cross through that square on the board. 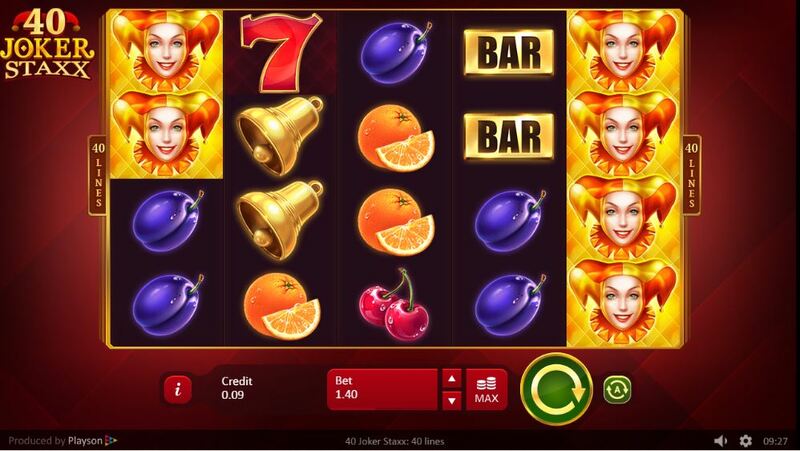 The majority of symbols in this online slot are fruits. Low values are represented by a lemon, plum, a pair of glistening cherries and an orange, complete with a mouthwatering slice. Each offers 0.02 for 3 of a kind, 0.10 for 4 and 0.60 for matching 5. Grapes and watermelons are the highest value fruits (0.04 for 3 of a kind, 0.20 for 4 and 1.00 for a 5 match) while bells and bars are higher (0.10 for 3x, 0.30 for 4x and 1.20 for 5x) while lucky 7’s are higher still (0.10 for 3x, 0.40 for 4x and 2.00 for 5x). Joker WILDS can substitute all symbols except SCATTERS, offering 0.20 for 3x, 1.00 for 4x and 8.00 for matching 5 of a kind. However, this is nothing compared to the star SCATTERS which can appear anywhere on the board and reap huge rewards if you hit 5 on the board. They offer up 0.80 for 3x, 4.00 for 4x and a whopping 40.00 for 5 of a kind!